Amid growing concern over social media’s impact and influence on today’s youth, a new Pew Research Center survey of U.S. teens finds that many young people acknowledge the unique challenges – and benefits – of growing up in the digital age. Today, social media use is nearly universal among teens.1 While notable shares say they at times feel overwhelmed by the drama on social media and pressure to construct only positive images of themselves, they simultaneously credit these online platforms with several positive outcomes – including strengthening friendships, exposing them to different viewpoints and helping people their age support causes they care about. 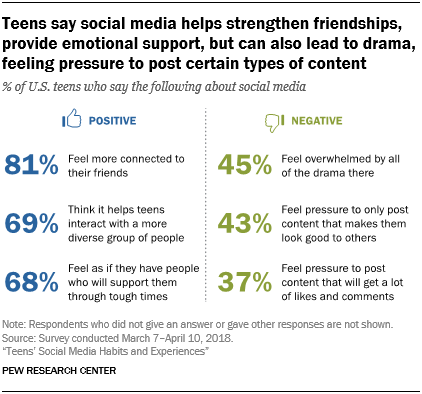 Roughly eight-in-ten teens ages 13 to 17 (81%) say social media makes them feel more connected to what’s going on in their friends’ lives, while around two-thirds say these platforms make them feel as if they have people who will support them through tough times. And by relatively substantial margins, teens tend to associate their social media use with positive rather than negative emotions, such as feeling included rather than excluded (71% vs. 25%) or feeling confident rather than insecure (69% vs. 26%). Young people also believe social media helps teens become more civically minded and exposes them to greater diversity – either through the people they interact with or the viewpoints they come across. Roughly two-thirds of teens say these sites help people their age interact with individuals from diverse backgrounds, find different points of view or show their support for causes or issues. And they see digital environments as important spaces for youth to connect with their friends and interact with others who share similar interests. For example, 60% of teens say they spend time with their friends online on a daily or nearly daily basis, and 77% say they ever spend time in online groups and forums. The survey also illustrates the ways in which teens navigate social norms around what – and how often – they post to these sites. It is much more common for young people to post about their accomplishments or family life than to discuss their personal problems or political beliefs on social media. And while Millennials – some of whom are just older than teens – have been deemed the “selfie generation,” roughly half of today’s teens say they rarely (25%) or never (26%) post selfies on social media. For some teens, sharing their life online can come with added social burdens: Around four-in-ten say they feel pressure to only post content on social media that makes them look good to others (43%) or share things that will get a lot of likes or comments (37%). At the same time, the online environment for today’s teens can be hostile and drama-filled – even if these incidents may fall short of more severe forms of cyberbullying. 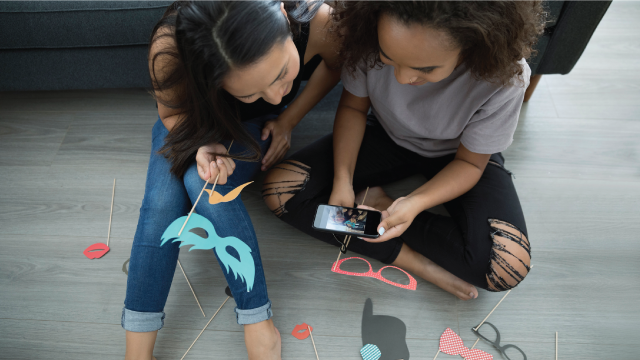 Some 45% of teens say they feel overwhelmed by all the drama on social media, with 13% saying they feel this way “a lot.” And a similar share of teens (44%) say they often or sometimes unfriend or unfollow others on social media. When asked why they’ve digitally disconnected from others, 78% of this group report doing so because people created too much drama, while 52% cite the bullying of them or others. These are some of the key findings from the Center’s survey of 743 teens, ages 13 to 17, conducted March 7-April 10, 2018. Throughout the report, “teens” refers to those ages 13 to 17.